CALBAYOG CITY, Samar – After strictly watching over the ballot boxes for a night and hanging on the municipal building for the canvassing of votes, the COMELEC finally proclaimed the winner of the mayoral race of Lavezares, Northern Samar a day after May 10 automated polls. From more than 15 thousand voting population, Quintin B. Saludaga made it again when he obtained 6,737 votes against 6,239 of Artemio H. Balag. Teary-eyed reelected Lavezares Mayor Quintin Saludaga expressed gratitude to his constituents for winning in the May 10, 2010 polls over Balag. In an interview, teary-eyed Saludaga expressed his gratitude to the people for believing once more in his administration. He appealed that the opposition should respect the result of the election as it apparently manifests the truth and preference of the constituents. He however made a comment to the time consuming casting of votes for there were others who were not able to make it to their polling precincts as they could not stand waiting in queue for it lasted until wee hours in the morning. Out of 15,772 registered voters, only 13,345 voters actually voted overlooking 2,427 voters. According to him, democracy was not fully exercised when others went home, decided not to cast their votes. Notwithstanding the procedural and technical defects (i.e. PCOS shutdown, inability to transmit ERs & etc.) experienced in selected polling precincts, he never questioned the result of poll automation as compared to the manual counting in the previous elections. Reelected Saludaga who have been the subject of protests and harassments way back 2007 elections was forced to relinquish his post in the last quarter of 2009 by virtue of the cease and desist order of the COMELEC’s Second Division through Commissioner Nicodemo Ferrer just to grant Balag’s motion. He was compelled to give in just to uphold the serenity of his town and to protect the lives of the many people. But despite of it, he was not at all threatened to pursue his cause and defend himself by petitioning and filing an appeal in court against his strong opponent. It is note taking that the September peaceful/prayer rally in the municipal compound which lasted for more than a week is a firm manifestation how the people offered their support towards him and in order not to be intimidated by his opponent. He fought his battle up to the Supreme Court and been given fair justice when it granted his petition on April 7, 2010. Respondent Artemio H. Balag was ordered to cease and desist from performing the functions of Mayor of Lavezares, Northern Samar, and he was reinstated. In an 18-page decision of the Supreme Court, it says that the petitioner did not commit forum shopping. The COMELEC en banc erred in denying outright the petitioner’s Verified Motion for Reconsideration of August 12, 2009 Resolution. The COMELEC en banc also erred in granting the Manifestation and Motion filed by respondent Balag. Finally, the petitioner in his Verified Motion for reconsideration has raised factual issues; and the COMELEC, a specialized agency tasked with the supervision of elections all over the country is vested with the exclusive original jurisdiction over election contests. With these, the Supreme Court resolved that the case be remanded to the COMELEC en banc. Given another chance as mayor, he wanted to pursue his plans for Lavezares – environmental, educational such as scholarships, health and agriculture. 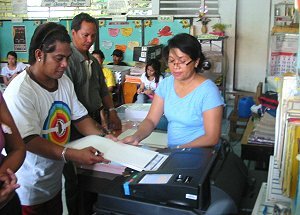 MAASIN CITY, Southern Leyte – Eighteen defective data cards located in ten local government units (LGUs) of this province caused anguished delay in the proclamation of winners in the respective localities four days after the automated elections – and the days of waiting may wore on if no new flash cards will come. A collateral effect to this technical glitch was that the provincial canvass also got stalled, since no data from the field can be uploaded in the canvassing and consolidated system (CCS) unless all the ten LGUs can send in their complete, 100% results in electronic mode. Sources at the provincial office of the Commission on Elections (Comelec) said someone was already personally sent to get the new compact flash (CF) cards, stressing that for now a physical retrieval of the new CF cards, and bringing those to the concerned places, is the ultimate solution. Macrohon led the list of places with four defective CF cards located at barangays Amparo, Sindangan, Buscayan, and Flordelis, while five others – four towns and one city – had two defective CF cards per LGU. These included the towns of Liloan, at barangays Poblacion and Pandan; Limasawa - at barangays Triana and San Agustin; San Francisco - barangays Anislagon and Bongbong; Sogod - barangays Buac Daku and Kanangkaan; and Maasin City - barangays Pansaan and Maria Clara. The rest of the LGUs had one barangay affected in each one of them: barangay Nava in Hinunangan; Cabagawan in Saint Bernard; Rizal in Tomas Oppus; and Sabang in Malitbog. This list was taken from a document signed by Atty. Antonio Gulay, Provincial Election Supervisor, dated May 11, 2010, 6:30 in the afternoon. In other words, a day immediately after the polls, Comelec higher-ups were already duly appraised and made aware of the problem in the province but the expected solution was not easy in coming. Gulay had told PIA he saw no resort other than waiting for the alternate CF cards to be around so the affected LGUs can go on with their canvass and transmit the results to the provincial level either through electronic submission or by personally carrying the memory cards when signal is weak. On May 12, two LGUs – Hinundayan and San Juan – did just that, wherein the concerned Election Officers brought the data to the provincial canvass board to upload, in addition to Padre Burgos which was received in a similar manner on May 11. So far, complete, official result from only nine LGUs had been received by the provincial canvass board, those Anahawan, Bontoc, Libagon, Pintuyan, San Ricardo, and Silago – all these six LGUs transmitted electronically. In Maasin City, proclamation was put on hold pending the arrival of the two new CF cards. CAMP APOLINARIO, Panacan, Davao City – Communist New People’s Army (NPA) abducted four unarmed government troops while attending a child’s birthday party in the village of Sawangan in Mawab town in Compostela Valley (ComVal) province 12:00 Noon Wednesday. Corporal Marcial Bawagan was visiting his family in time with the birthday of his three year-old son together with Cpl. Ariel Asumo, Cpl Eduardo Alcala and Cafgu Victor Pitogo when they were seized at gunpoint by armed NPAs inside their home. The NPA’s Local Terrorist Front-27 (LTF-27) is reported to be responsible in the abduction; the same band of terrorists responsible in Tuesday’s carnage in Maragusan town. Witnesses said the victims were forcefully taken to a waiting black van and sped away going to the direction of the village of Sangab also in ComVal province. Marcial’s wife Jenny was crying while carrying their son Jennylmark who is celebrating his birthday and looking for his father. Neighbors can do nothing but to console her while her three other children were crying with her. She said she cannot accept that the NPAs abducted her husband on their son’s birthday. “They are heartless.” Jenny said speaking in vernacular. The community is seeking the help of the Catholic Church to intervene in behalf of the victims. Jenny consulted with Father Christopher Segura, the parish priest in the locality who is making moves to establish contact with the abductors. The NPAs were reportedly disheartened due to the loss of most of their favored candidates both in local and national political arena. Information gathered from the field indicates that the peaceful conduct of the election was a big slap on their face for insinuating a chaotic polls and even floating the idea of failure of election. The attack authorities said, is a desperate effort to cover their blunder in the Maragusan massacre last Tuesday. It may be recalled that last Tuesday, five persons including a civilian pollwatcher were killed and another 12 were wounded when 48 individuals composed of Board of Election Inspectors, Pollwatchers and soldiers were ambushed by NPA terrorists in the village of Mahayahay in Maragusan town in the same province. People of Maragusan and the whole province including ComVal Governor Arturo Uy condemned the attack saying “It is so barbaric.” The dead civilian is a pollwatcher of Uy who is aligned with Nacionalista Party. The three other wounded civilians were pollwatchers of Nacionalista party having two and Liberal Party with one. MAASIN CITY, Southern Leyte – It’s all over here except for the non-arrival of two new memory cards to replace the faulty ones. Out of 89 clustered precincts in the city, the Board of Canvassers as of yesterday had canvassed 87 of them, leaving only the two precincts of barangays Maria Clara and Pansaan, two places where the Precinct Count Optical Scan (PCOS) were not tested and sealed over the weekend, and thus were not used. Voters in these areas were instructed to shade the official ballots just the same and place them direct in the ballot box, and once the PCOS will be functional with a new data card the chair of the Board of Election Inspectors (BEIs) in those precincts will be the one to insert the deposited ballots in full view of all watchers. Two days after the elections this singular act was not yet done, and the voters missed the chance and thrill of feeding the PCOS. City Election Officer Lawrence Gelsano, in an interview by Monching Buyser of DYDM, said they cannot proclaim the winners just yet because by procedure they have to complete the canvass 100% before making the proclamation. Besides, results in the remaining two precincts may greatly affect the tenth and last spot for the City Councilor line-up, Gelsano added. As it is, the tenth place is being occupied by incumbent City Councilor Antonio Cardoza, while the 11th spot following him is rival Dr. Celso Borres’ from the opposite ticket. Keen observers have mixed speculation on the last two uncanvassed precincts which could yield about 1,000 ballots or votes, whether this can dislodge Cardoza for Borres, or ensure the former’s claim on the last contested seat. The official, partial tally for 87 out of 89 precincts showed incumbent Congressman Roger Mercado garnering 30,208 votes, while former Congressman Aniceto Saludo got 9,665. For the mayoralty race, incumbent Mayor Maloney Samaco had 26,088 votes, while two-time challenger, former Gov. Rosette Lerias got 13,510 votes. PIA was unable to get the partial results for the position of governor as of this writing. At the provincial canvass, only six towns so far were able to electronically transmit the results, and these were the municipalities of Anahawan, Pintuyan, Silago, San Ricardo, Libagon, and Bontoc. Provincial Election Officer Atty. Antonio Gulay said yesterday he expected the Election Officers of Hinundayan and San Juan to personally come to give their flash cards being unable to submit by electronic transmission. Padre Burgos was able to transmit its results to the central server, but not to the provincial canvass, so a physical transfer of the flash card was also expected for the town as of yesterday. TACLOBAN CITY – The coconut farmers particularly the Agrarian Reform beneficiaries of Biliran continues to receive support from the ARB Agribusiness Entrepreneurship Development Program-Sustainable Integrated Coconut Area Development ((AREDP-SICAD) as part of the numerous assistances extended by the Department of Agrarian Reform (DAR). Mr. Jose Alsmith Soria, DAR 8 Regional Information Officer informed that Provincial Agrarian Reform Officer (PARO) Elisea Orapa last week distributed to the federation of ARC cooperatives in this province, a shredding machine worth P70,000 for the farmers’ bio-organic fertilizer production. The machine fabricated by the Visayas State University (VSU) and jointly funded under the PCA-Coconut Genetic Network and the AREDP-SICAD, PARO Orapa explained, was accompanied by a rice hull carbonizer which could also be used to boost the project. According to PARO Orapa, AREDP-SICAD released in 2009, some P287,000 for the copra trading, bio-organic fertilizer production and banana production activities of the federation. In June, the federation is expected to be recipient of some sets of decorticating, twining and combing machines from the Philippine Exports, Inc. for the farmers’ proposed coco coir and geo-textile production projects to expand their operations, PARO Orapa added. Mr. Sam Helerra of the Philippine Export, Inc. earlier assured the federation of technical assistance in their operations and subsequently in the marketing of their products, she disclosed. PARO Orapa said that Biliran is so fortunate to be included among the recipients of the AREDP-SICAD nationwide program which was introduced in 2006. The Program intends to improve the coconut industry by introducing innovations and appropriate interventions in identified areas in order to increase coconut production and develop high value-adding enterprises, and eventually to establish market linkages locally and internationally. In Biliran, six ARCs in the municipalities of Biliran, Almeria, Cabucgayan and Caibiran were covered by the program benefiting some 1,500 agrarian reform beneficiaries. Initially, 4,000-hectares of coco lands in the province were targeted for rehabilitation, intercropped with bananas. With the outpouring support extended to these ARBs under the Comprehensive Agrarian Reform Program (CARP) income of every ARB household is expected to rise as the coconut industry in this island-province is seen to boom in the near future. CATBALOGAN CITY – Catbalogan City election officer Salvador Cruz as Chairman of the City Board of Canvassers at 12:50 midnight today, declared Coefredo ‘Tekwa’ Uy as the winner of the mayoralty race in Samar’s capital city. Uy has another Uy opponent, Judge Alma Uy, which he beat by close to ten thousand votes. The Board of Canvassers also decided to proclaim nine out of ten Sangguniang Panglungsod members as one barangay Cagutsan from an island named Sierra has yet to report voting results for their 648 voters. However, Cruz maintains that the results will not affect Uy’s lead and that of his Vice Mayor elect Art Gabon. The winning councilors is lead by Uy’ s lovely daughter Stephanie Uy-Tan followed by Ernesto Arcales, Jovito Redaja, Christine Joy Escober, Rodrigo Perez, Rodolfo Aquino, Teodoro Ilagan, Joselito Mendoza and Maximo Pescos. Cruz added that the 10th councilor will be proclaimed late today with the result of the 87th final precinct. Meanwhile, in the provincial scene, the three Tans, mother Milagrosa, daughter Sharee Ann Tan and son Stephen James Tan are leading the race in the top positions of Samar’s political landscape. Milagrosa Tan, although earlier disqualified is seeking the second district congressional seat. Daughter Sharee Ann is seeking the gubernatorial post, trading places with mom Milagrosa. Neophyte Stephen James leads the Vice-Gubernatorial race. Stephen is husband to Catbalogan Mayor Uy’s daughter Stephanie. But the couple belongs to opposite parties as their parents are known to be ‘kontra-pelo’ (rivals) in politics in Samar. This has been the second day when the Samar Provincial Board of Canvassers have stood vigil until the wee hours of the morning, to receive electronically transmitted results from the municipalities. As of press time some nine vote-rich towns have yet to transmit their results. Comelec Supervisor standing as PBOC chair is Atty. Corazon Montallana as joined by Provincial Prosecutor Lluz, and DepEd Samar Division Assistant Superintendent Bernardo Adina. CATBALOGAN CITY – After municipal Consolidation/Canvassing Systems (CCS) from various precincts in the entire Samar province failed to electronically deliver their vote casts to the provincial CCS, the COMELEC has finally decided to suspend the process past 10pm yesterday, May 10, 2010 at the Samar provincial capitol building. With no specific areas mentioned, COMELEC Chairperson Maria Corazon S. Montallana confirmed that some municipalities in Western Samar were unable to send vote data to the provincial canvassing unit via Very Small Aperture Terminal (VSAT). As a remedy, the process was temporarily aborted as these areas will then physically relay their data using USB flash discs. By 5 o’clock in the morning of May 11, 2010, canvassing has to resume, Montallana mentions. With this delay of vote consolidation, personnel who convened in the CCS hall of the provincial capitol building were directed to leave the area for security reasons, including the Board of Canvassers itself, party representatives and the people from the press. Armed forces were outside the building to deny any unwanted activity and partisan entry. To further strengthen electronic securities, or to avoid vote manipulations, the members of the Board of Canvassers brought with them the safety tokens so that no third party will be able to illegally intervene in the process. The COMELEC has been preparing the provincial Consolidation/Canvassing System with a large cut of their time already been spent. 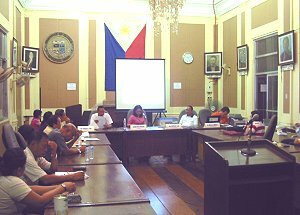 On May 9, 2010, Sunday, a day before the elections, the testing and sealing of CCS kit took place at the session hall of the Samar provincial capitol building. With experts to back up her undertaking, Chairperson Montillana officially lead the process of inspecting and validating the devices that will be used in the provincial canvassing. CCS Operator Nicolas Mendova and provincial technician Melvin Senining assisted in dismantling the box and reassembling the devices. The device entries were comprised of DELL VOSTRO 1520 laptop which will be used as the central monitoring device (with built-in Secure Digital card, CCS011200323), USB modem (B54CAA19B1607070), SIM pack cards, USB tokens (chair: 09122401857, vice chair: 09122401951 and BOC member: 09122401990) and USB extension cable. An LCD projector was also provided so that canvassing would appear public. Following the targeted plan, the canvassers and representatives from various sectors have to convene at the capitol building by noontime, with a break practically following it and then resume by 6 o’clock in the evening. However, due to the extension of the voting process, schedule for the recommence of monitoring was moved to 8pm. Then, by technical hitches, monitoring was postponed until 5am of May 11, 2010. CATBALOGAN CITY – Catbaloganons started voting as early as 7:15 this morning, as witnessed by PIA Samar. Madam Marieta Giray, Chairman of the Bureau of Election Inspectors (BEIs) would want the voting to start immediately at 7:00 AM however, she had to wait for the poll watchers to open the book of voters and other sealed election paraphernalia and sign them with the watchers. The first voter ever at Precinct number 4 at Catablogan 1 was Benito Ignacio, 70 a former teacher who said he voted for 6.5 minutes, younger Grave Aguirre, 25, was third in line but he was faster to shade and therefor the first to test how well the Precinct Optical Counting (PCOs) machine worked. Aguirre told PIA he is satisfied with the outcome of his ballot and added he trusts this electoral process. Incumbent mayoralty candidate Coeferdo Uy voted at ten in the morning and looked tired so he avoided having his picture taken. The first batch of voters were mostly senior citizens who said they avoid the warm weather so that a six in the morning, they were already seen lingering in the polling place and locating their names in the prepared voters’ list. In Catbalogan 1, the public will see a Joint Security Control Desk manned by a PNP member and an Alert official (NGO), personnel from the Parish Pastoral Council for Responsible Voting (PPCRV) also man the Voters’ Assistance Desk. In a phone call to City PNP Chief Joseph Pensotes, he claimed that the electoral process is generally peaceful that his PNP force has been given augmentation. His men are presently roving to monitor the on going political exercise. Samelco 2 general manager Ponciano Rosales as he was about to vote was asked by the media how stable the power supply. “Electric supply is stable,” he assured the people. He mentioned though that in Basey town (some 107 km southeast of Samar’s capital city), power tripped this morning but was immediately restored. He added that at least two linemen are posted in his area which includes 15 towns and the city of Catbalogan. TACLOBAN CITY – Five men were apprehended at the Comelec checkpoint at Barangay Burabod, Kawayan, Biliran for illegal possession of firearms and ammunitions relative to Comelec Resolution No. 8714. The apprehension was conducted by the elements of Kawayan Police Station led by Police Senior Inspector Estanislao Palconit Corpin who is the chief of Police, together with four PNCOs. Apprehended were Rebosada Caberte, 48 years old, married, resident of Barangay Balite, Kawayan, Biliran; Pablo delos Reyes Tobias, 33 years old, single, resident of Barangay Marca Tubig, Tinambacan, Calbayog City; Roberto Bretania Deano, 51 years old, married resident of Barangay Veriato, San Isidro, Northern Samar; Samuel Enriquez Solayao, 44 years old, married, resident of Tacloban City; and Rolando Cayanong Odivelas, 42 years old, married, resident of Tacloban City. Said suspects were on their way to the northern part of Kawayan, Biliran when accosted at the Comelec checkpoint manned by the elements of Kawayan Municipal Police Station. The suspects were on board an Isuzu pick-up bearing plate number GKA 413, registered under the name of Francisco Colenares Jr, resident of 211 Esperaz Avenue, Tacloban City. Confiscated from their possession and control were: one (1) m16 rifle with SN P00038 marked Elisco with two (2) magazines, one (1) long and one (1) short containing 48 live ammos; one (1) mini UZI with SN IMI01671 with two (2) long magazine and one (1) short magazine containing fifty-one (51) live ammos; one (1) .45 caliber pistol with SN AOC42747 marked Thomphson with attached silencer with one (1) magazine containing eight (8) live ammos; five (5) units nokia cellphone and one (1) pc black bonnet. Subject persons are now in the custody of Kawayan Police Station for proper disposition. TACLOBAN CITY – On or about 9:55 in the morning of May 7, 2010, elements of Bravo Coy, 34th Infantry Battalion of the 8th Infantry Division were ambushed by armed men while conducting foot patrol at Barangay Bag-otan, Matuguinao, Samar. Reports coming from the PNP Media Center for HOPE 2010 identified the armed men as Tony Velarde, alias Tonggao Borden, Enisito Floquencio, Fidang Florencio, Betty Sorio, alias Tambotso Anterio, alias Bornok Morillo, Emed Casaljay, Nestor R. Mesario, Yobit Dias, Demas Obiado, Jelita Velarde, Wilma dela Cruz and Edwin Floquencio. The firefight which ensued lasted for about fifteen (15) minutes, resulting to the death of CPL Roel Alao and the wounding of PFC Noriel Mengote. The suspects scampered to unknown direction after the incident, the report stated. The Matuguinao Police Station is currently conducting thorough investigation after which it will file appropriate charges in court against the perpetrators. Despite the incident, Police Regional Director Rey Lañada said that the peace and order condition of the Region is still normal and everything is under control with the combined operatives of the Philippine National Police and the Armed Forces of the Philippines under the Comelec supervision. TACLOBAN CITY – No municipality or city in Region 8 has been declared as election hotspots, Senior Superintendent Manuel Cubillo, spokesman of the Philippine National Police Region 8 said. SSupt. 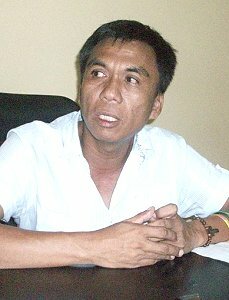 Cubillo however, disclosed that 54 areas in Eastern Visayas are under election watch list. Among these areas are six (6) in Leyte; one (1) in Southern Leyte; twenty-one (21) in Samar; eight (8) in Eastern Samar; and seventeen (17) in Northern Samar. These areas in Region 8 are being closely monitored by the Philippine National Police in order to prevent untoward incidents during the May 10 general elections, SSupt. Cubillo said. He explained that some areas were included in the watch list due to a history of violence in the past elections. The three Samar provinces are the usual areas in the Region, he added. SSupt. Cubillo did not divulge the specific areas to prevent undue fear to the public. The directive of Police Region 8 Director Rey Lañada is for the police provincial and station commanders to strengthen their security preparations for clean, honest and orderly polls. A total of 500 election watch list areas of immediate concern and seventeen (17) areas of immediate concern are now being monitored by the Philippine National Police, the Armed Forces of the Philippines and the Comelec.